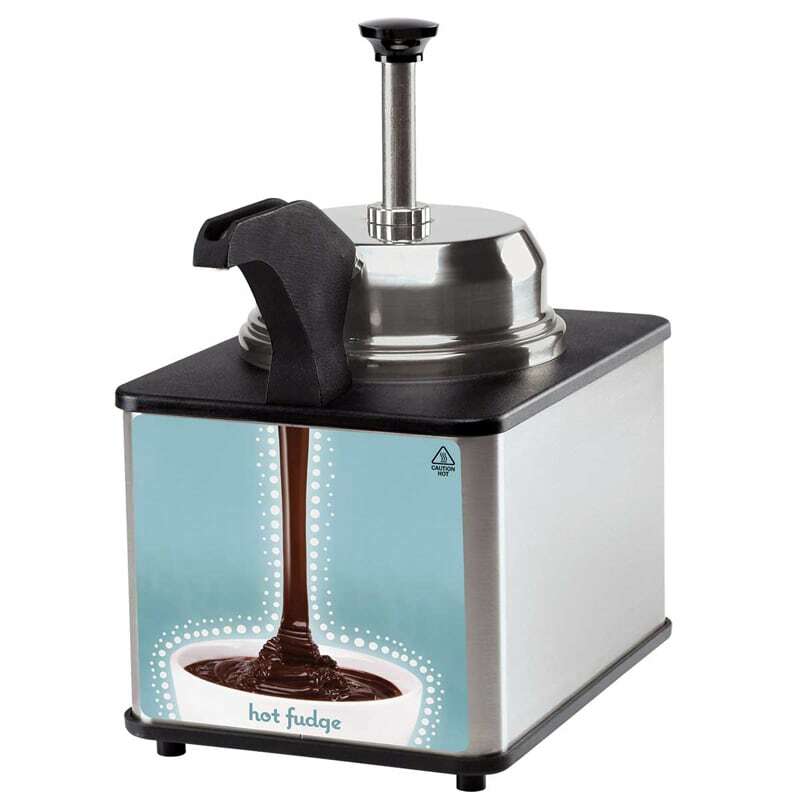 The Server 81140 Supreme™ topping warmer dispenses caramel, fudge, and cheese to accompany desserts and chips. Its precision thermostat keeps toppings at consistent temperatures, even as the contents deplete, so cheese and sauce does not burn. Additionally the spout is heated, so contents do not cool and clog it, and this warmer can be used with a No. 10 can or a 94009 3-quart stainless steel jar. A water bath fill line reduces the risk of overflow. The bottom and top of the Server 81140 topping warmer are made of black thermoset plastic, so they keep their shape when they are heated. A cast valve body pump yields a maximum portion of 1 ounce and adjusts in 1⁄8-ounce increments, enabling precise control over the toppings for product consistency. Three magnetic merchandising signs come with the Server Products 81140 topping warmer, including caramel, fudge, and cheese. You can check out our Server Products warmers guide to learn about the different types warming equipment available. 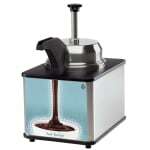 "Servers products are excellent quality, the pumps work flawlessly for hot fudge or cheese. 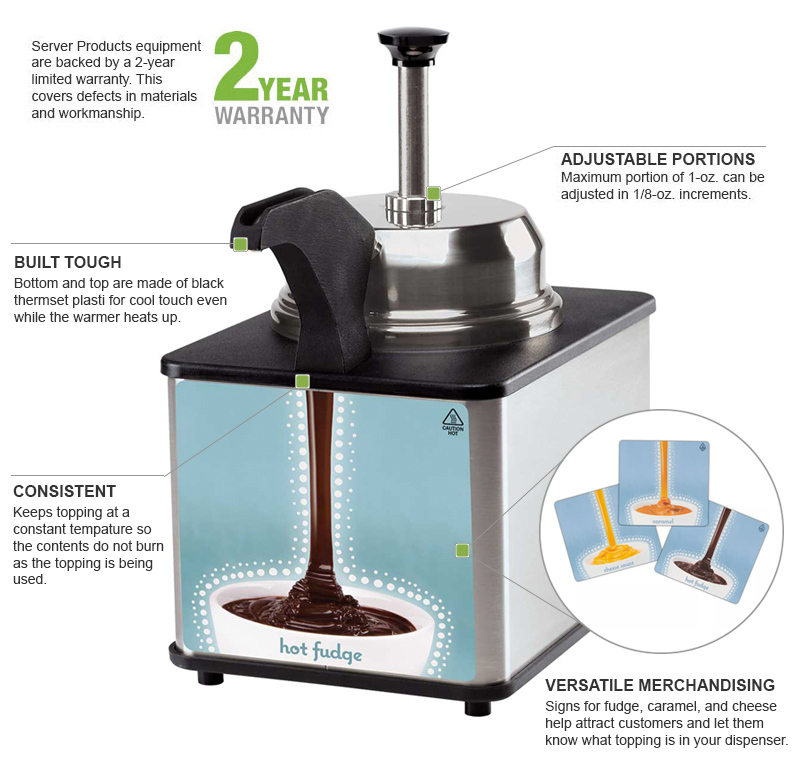 Cleans out easily these pumps and warmers are more exp..."
"Servers products are excellent quality, the pumps work flawlessly for hot fudge or cheese. Cleans out easily these pumps and warmers are more expensive but worth the money and made in the USA"